J'zhar is a dead Khajiit witchblade found in the Alftand Glacial Ruins near Winterhold. His brother J'darr is nearby and still alive. 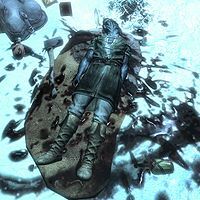 Reading his journal, it appears that J'darr is most likely to blame; however, some Research Notes found in the previous room reveals that the Khajiit brothers were attacked by Dwarven automata. J'zhar wears a randomly determined set of farm clothes (7 variants) or a belted tunic, boots (4 variants), and has a 50% chance of wearing a hat (3 variants). There's a small possibility of him carrying a small amount of gold and a lockpick. After entering Alftand Glacial Ruins, a delusional J'darr can be heard speaking to his deceased brother, looking for the skooma that he believes J'zhar had hidden. "Where is it? I know you were trying to keep it for yourself J'zhar... You always try to keep it for yourself!" Unable to find any hidden skooma, his behavior becomes frenzied, convinced that the dead J'zhar is in fact trying to steal his skooma: "No! There's got to be more Skooma... Shut up! Shut up! Don't lie to me J'zhar! You hid it! You always try to steal it from me!" As you move closer, J'darr will assume you are part of the expedition. "What? Who is this, Brother? Another of the smooth skins looking for food? But this one wasn't trapped with us..."
If J'zhar is raised with a reanimation spell and then killed, it will trigger the Rejoining the College quest. This page was last modified on 19 April 2019, at 00:41.